While 400 square feet might seem tiny by most standard, it borders on what some tiny homeowners consider quite large. In fact, the average tiny home is anywhere between 100 square feet and 400 square feet. Compare that to the whopping 2,600 square feet of living space in the average home, and you can easily see that tiny truly means tiny. And with the ever-increasing interest in a simple lifestyle, these mini houses make living with less a reality. 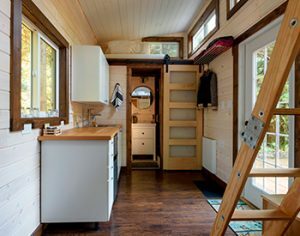 Tiny homes come in all shapes and sizes and can be built as entirely mobile or semi-permanent structures. They are an ideal solution for those who want to travel the world without giving up the comforts of home. Not only that, their small footprint makes them more energy efficient and cheaper to maintain. Read further for more information on tiny living to determine if it’s the lifestyle for you. These micro-structures, more commonly referred to as tiny houses, come in all shapes, sizes and colors. They range in size from 100 square feet to 400 square feet. Many are custom built to the owner’s design plan and specifications. However, some homeowners choose to build their dream house out of an adapted trailer or box container. For those looking for a simple solution for their tiny house, there are companies that sell tiny house kits. The kit comes with the prefabricated parts and supplies needed to erect a rather impressive house. Tiny houses can be mobile or semi-permanent structures that either sit atop wheels or can be hooked to a trailer for easy relocation. Some homeowners, however, choose to build a permanent structure on private land purchased specifically for their home. According to the U.S. Census Bureau, the median price of a new home in 2017 was a little over $402,000. Add to that the mountain of increased student loan and credit card debt, it is easy to see how 76% of American’s are living paycheck to paycheck. It is for that very reason why so many are choosing to downsize not only their belongings but their debt as well. The cost to build a tiny house varies widely and ranges anywhere from a mere $6,000 to over $25,000. Due to their affordability, experts estimate that 68% of tiny house owners have no mortgage. It takes less energy to fuel a tiny house. Often, they are built as self-sustaining units that employ solar panels for fuel and water catchment systems. With that said, you can essentially live “off the grid” and avoid the utility bills associated with a traditional house. Their tiny footprint makes them ideal for relocation at a moment’s notice. With a tiny house, you will have the freedom to travel the world while keeping the things that make life comfortable close at hand. Downsizing to only the essential items makes it easy to focus on the things, relationships and experiences that truly enrich your life. A tiny house can serve as an in-law suite or a guest suite. It can also serve as an adapted home for those with mobility challenges. If you are heading into retirement, you may find that tiny house living makes sense for your new lifestyle. It can be the perfect solution to spend time at a dream destination without the cost of purchasing a new home. Related Article: When is it time to downsize? Perhaps one of the most appealing aspects of tiny houses is that they are mobile, allowing you the freedom to take your home with you as you explore the world. It is this mobile nature, however, that leads many local zoning boards to classify them as recreational vehicles. As such, they don’t fall under Housing and Urban Development (HUD) or International Residential Code (IRC) building guidelines. So, when it comes to getting permission to build a tiny house, you may find it difficult to secure the construction permits. Ultimately, could end up with an illegal structure and risk facing fines and penalties from the local zoning board. You may even be forced to tear down the house or relocate it to another site. You could attempt to avoid these issues by moving your home to an RV park. Unfortunately, this is often not an ideal solution as many RV parks have a time limit for mobile home owners. You could end up moving more often than you like just to comply with local regulations. Tiny houses don’t quite fit into the lending guidelines established for traditional homes. Often, banks have a minimum mortgage amount. Thus, due to their relatively low cost, most tiny houses don’t qualify for conventional financing. You may need to rely on their savings on loans from family members to make your dream of tiny living come true. Furthermore, insurance companies aren’t quite sure how to issue policies for a structure that is part home, part RV. Ultimately, you could find it difficult to secure an insurance policy for your house. Sadly, you could get hit with significant out of pocket costs in the event of an accident or damage. Deciding if a tiny house is right for you comes down to your goals. If saving money is your primary motivation, a tiny house fits the bill. If you enjoy the ability to relocate at a moment’s notice, then a home on wheels could be ideal for you. While there is some misconception that tiny houses don’t work well for families, some believe that that small space leads to a richer life. With less stuff to worry about and freedom of movement, you can focus on your family bond as you explore the world together. While living the tiny lifestyle can be rewarding, it does not come without its challenges. There is considerably less living space, which means that the size of your family eventually does become a factor. In fact, most local building regulations restrict the number of occupants in a dwelling based on square footage. Further, some of the legal and financing challenges discussed above may make your dreams of a tiny home more of a hassle than the reward you are after.